Matt Heaton Concert – Saturday, 1/26! 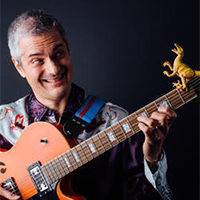 Join us for a special family concert at the Library! Matt Heaton will be performing in the Main Library’s McCarthy Meeting Room from 10:30 – 11:30 on Saturday, 1/26. No need to register – this is a completely drop-in event, and Matt’s fun blend of rockabilly, surf, and American roots music will have you tapping your toes and shaking off your winter chills in no time!